Nigel and I went to check out the first spring tide of the series this week. I arrived about an hour before high water and as I walked along the shore I passed two other pairs of anglers who were already in action with spinning rods but no one had caught anything yet. I knew that there would be huge weed middens further along the beach and that my pal would have sussed where to go so I kept on trudging. Even though there was a bit of a breeze and I was only wearing a T shirt and a thin jumper, by the time I reached Nigel I was sweating profusely. 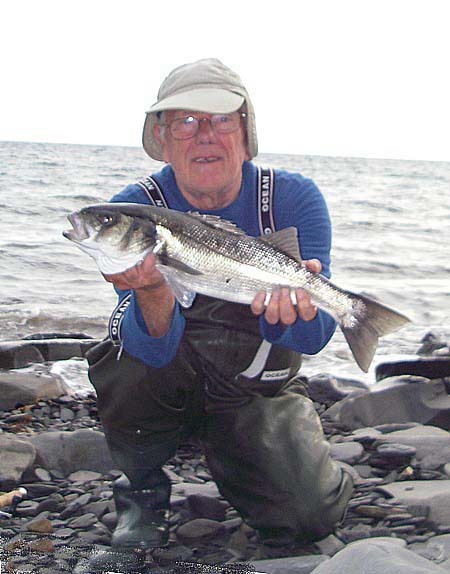 It was a relief to lay the bag and the spinning rod on the rocks and venture down to the water's edge. Already the mullet were gathering and both of us were armed with maggot flies and rarin' to go. 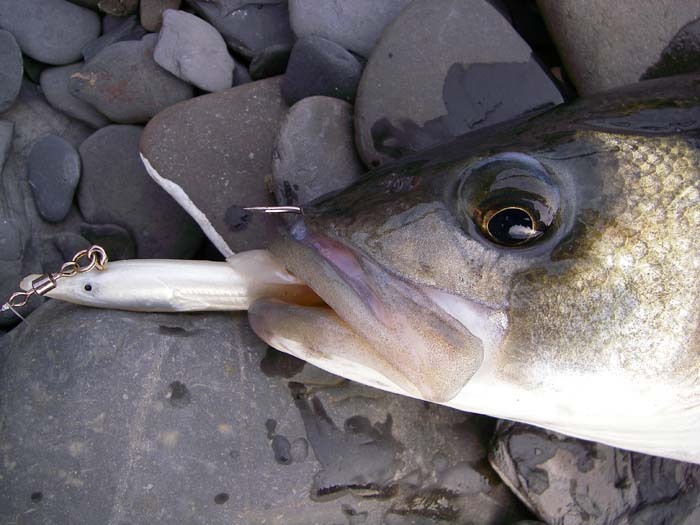 Despite the large numbers of fish, both mullet and bass, surface feeding they were not easy to tempt. After about fifteen minutes I hit a big mullet but after one screaming run it came unstuck. Bugger! Or words to that effect. we continued to cast our flies to the fish but it was hard to get a bite of any sort. Perhaps ten minutes later I hit another large mullet but again it tore out to sea before unhooking itself. Frustrating or what! It was just after high water when, having a little difficulty baiting up, I realised that the point had gone from the hook of my maggot fly. The fish were still there but Nigel was having no better luck than me so I decided to try and catch a bass and picked up the spinning rod. The first cast with my weighted Redgill was encouraging - a couple of plucks. Was it going to be one of those evenings when small schoolies kept tugging at the tail of the lure and failing to hook themselves? I hoped not. 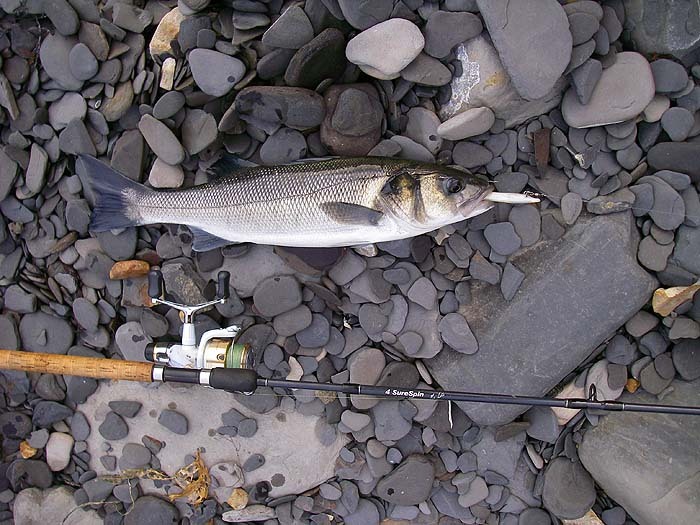 The bites had been close in so I assumed that the bass were in the same band of water as the surface feeding mullet and kept flogging away close in. Suddenly the rod bowed over and there was a big splash that put the wind up the mullet shoal. I was in. Please don't come off! I thought as the fish made the clutch scream. I need not have worried because it was well hooked and before long I was able to slide it ashore through the boulders. As I began to pack in for the walk back, Nigel, still fishless, switched to a little Delta eel on his fly rod and, although the fish had thinned out, soon had a schoolie on the fly. All in all it could have been worse. When I walked back the other anglers had already left - presumably fishless.